Makes short work of dirty floors, giving them a deep clean no mop could achieve on its own. 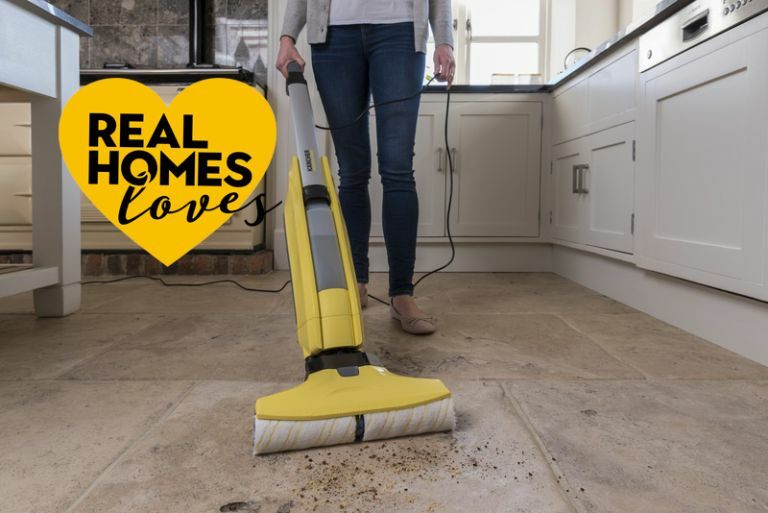 A great buy for anyone with all hard floors and a mucky family – but be prepared for the strength of the machine's pull across the floor. Great for giving floors a deep clean fast. Little water used, meaning floors dry very quickly. Slim construction makes storage practical. Won't pick up larger debris. Can't stand up unless leant against something or in its stand. Pull of the machine is very strong, making it unsuitable for frail users or anyone with mobility issues. The Kärcher FC5 hard floor cleaner is designed to make floor cleaning a one-step job. So, instead of vacuuming and then mopping or scrubbing, this machine is touted as being able to do both jobs at once. But does it live up to its promise? We put the FC5 hard floor cleaner through its paces on a selection of hard flooring types – wood, tiles and concrete – to see how it would cope, and what the results would be. Read our review to find out if it passed muster. Which surfaces is the FC5 hard floor cleaner suitable for? The Kärcher hard floor cleaner can tackle sealed hardwood, laminate, tiles, cork, parquet linoleum, PVC, sealed, oiled and waxed parquet and stone floors; the SmartRoller technology is designed to vacuum up dust, small debris and pet hair, while controlling the flow of water to clean your hard floors gently yet effectively. For deep down dirt, you can also add detergent. What's included with the FC5 floor cleaner? The FC5 is happily easy to put together – simply click the handle into the body of the machine and you're just about good to go. I was surprised at how tall the machine is – I'm an average 165cm and it almost reached chest height. This confused me initially until I (bothered to) read the instructions to find out that the machine's cleaning position is at 60º to the floor, which put the handle at just above waist height, which is what I'd expect, and find most natural. Once assembled and sitting in its stand – which it needs to remain independently upright – you are advised to fill the stand's trough with 200ml of clean water then turn on the machine for a few seconds. There's no mark on the trough for 200ml so you'll have to dig out your measuring jug to get that right. Why fill the trough? It apparently gets the rollers to optimum wetness. Next, I removed and filled the clean water tank – this is easier to do as there's a 'max' line on the tank. A lid full of detergent (provided) goes in this tank, too. Then you simply replace the tank and you're ready to go. Operation is easy – there's just one on/off switch. My advice? Hold on to the handle hard initially when you switch it on. The FC5 vacuums and washes in one using SmartRoller technology, which means the machine moves forwards on its own. I'd compare the pull the FC5 gives you as it advances as comparable to a determined labradoodle heading to the park after a day shut in the house. I've got a dog and I work out (I know) but, after 30 minutes of using the cleaner, my arm felt like it had had a trip to the gym on its own. In other words, if I gifted it to my very elderly grandmother, I'd fully expect her to be pulled over by it – or for it to take off without her. I started it off on my kitchen floor, which had been vacuumed and mopped a couple of days before – so, I thought, not that dirty. The floor is a distressed hardwood, so it's hard to tell when it's dirty and when it isn't; I tried to concentrate on the areas beneath the oven, the dishwasher, the sink and the dining table. Then I stopped and removed the dirty water tank to see how the floor cleaner was doing (a peek at the rollers didn't give me much of a clue; they're self-cleaning and were, well, fairly clean). Apart from splashing myself in the face with dirty water as I removed the lid of the tank (my fault for not checking the instructions on which bit of the tank to remove), this part of the operation ran smoothly. The big surprise? The water I poured down my sink was filthy. I mean, shockingly dirty. Back to it, and I moved on to a tiled bit of floor that had had ashes spilt on them earlier in the day (by me, on purpose). I did notice here that the rollers left black streaks as it struggled to cope with this cunning ploy – but these were soon mopped away as the rollers self-cleaned. Next, I moved on to the hallway floor tiles. There's a fair amount of debris there at all times – two kids and a dog will do that for you. I noticed that the machine is pretty adept at vacuuming up smaller debris (bits of leaf, dust, etc), although you have to hold it at the right (60º) angle or it blows the debris away from the machine; however, it won't pick up larger items – but then did doesn't claim to. So, don't expect to buy an FC5 and ditch your conventional vacuum cleaner or dustpan and brush entirely. I have to say, though, that the hallway tiles were left gleaming in moments (until my eldest daughter walked mud through the hallway on her return from school about 20 minutes later). I also tried the FC5 on a concrete floor – again, good, shiny results, very quickly. What did I like about the FC5? Its roller position means that it cleans right up to the line where your skirting boards and floors meet. The swivel action on the vacuum head makes it easy to manoeuvre and also allows you to get under furniture, although it was too bulky to get very far beneath my freestanding kitchen units. It's plainly visible when your clean water tank is empty, and when your dirty water tank needs emptying. Again, pragmatic in design. The microfibre rollers are quick and easy to remove, too; you can machine wash them at up to 60°C, but a dousing under a tap was enough to clean mine – so that self-cleaning promise does come through. What didn't I like? I'd say in all honesty that the strength of the machine's self-advancing motion could go down at notch and still be effective. I also found the cleaner a little heavy and, when it's switched off, the rollers don't turn, which means dragging or hefting it back to the storage station (or leaning it against something while you go to fetch the storage station). It can't stand up on its own, don't forget. If I was really picky, I'd like a slightly longer electrical cable, too, but the 7m one provided will do most homes comfortably. All-in-all, though, it makes a quick and impressive job of floors that look clean to the naked eye, but clearly aren't. Job done.